New Online Training Modules meet annual prerequisite training requirements for frontline employees. 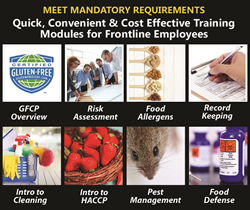 To support food manufacturers in meeting mandatory annual employee prerequisite training requirements founded on good preventative manufacturing practices, Allergen Control Group Inc. now offers quick, convenient and cost effective online food safety training modules for frontline employees. Food safety, food fraud and food security continue to be growing concerns in North America as demonstrated by the 764 food recalls that occurred in 2016. As a result, there is a continued increase in new and better voluntary food safety management system initiatives, including mandatory government requirements, such as the FDA’s Food Safety Modernization Act (FSMA) and the Safe Food for Canadians Act. Food manufacturers and importers of record are now totally accountable for all the risks and associated liabilities of producing safe and legal food. However, initially getting up to speed and then following new regulations and best practices can be time consuming and costly for manufacturers to implement, not to mention a challenge when trying to affect a culture change throughout the organization. To support food manufacturers in meeting mandatory annual employee prerequisite training requirements founded on good preventative manufacturing practices (GMPs), Toronto-based Allergen Control Group Inc. (ACG) now offers quick, convenient and cost effective online food safety training modules for frontline employees. Convenient mini-modules allow busy frontline employees to quickly and conveniently learn content and check their understanding by completing a short quiz. This means supervisors and managers no longer need to pull employees off the floor as training content can be consumed during gaps in busy work schedules. Managers can affordably view employee results and track team progress, internally. Each brief module will introduce a relevant topic ranging from managing allergens, cleaning, record keeping and pest management to risk assessment, HACCP and food defense. ACG has launched eight initial mini-modules, with new modules being added each month. Modules can be subscribed to on an individual basis, or at a discount when subscribed to as part of an available corporate training portal. Ranging from a basic package, which provides access to 3 modules for 15 users, to the Unlimited Package, there is something for companies of all sizes to optimize their workforce performance and manage frontline employee training within the corporate training portal. Custom packages are also available by contacting training(at)glutenfreecert(dot)com. “As owners of the Gluten-Free Certification Program (GFCP), ACG is committed to helping our clients be pro-active, reduce risk and protect their brand,” says Paul Valder, president and CEO of the Allergen Control Group, Inc.
About the Allergen Control Group Inc.